Use this WH15 universal wall hanger for 10-15 lb. CO2 fire extinguishers that have a loop hanger on the head of the extinguisher. 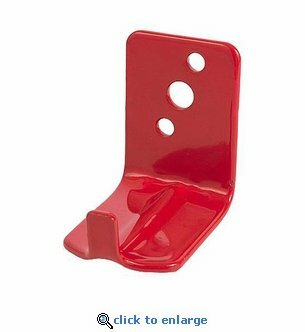 Other extinguishers this wall hook bracket can hold includes 11 - 15.5 lb Halotron I type extinguishers with a hanger loop on the extinguisher head. Mounting hardware required: #8 or #10 screws with appropriate wall anchors (not included). These wall hangers are quality manufactured of steel with a primed and powder coated paint finish. Also fits equivalent Ansul Sentry�and Badger models.